The development should lead to new, high-resolution imaging devices and medical applications. 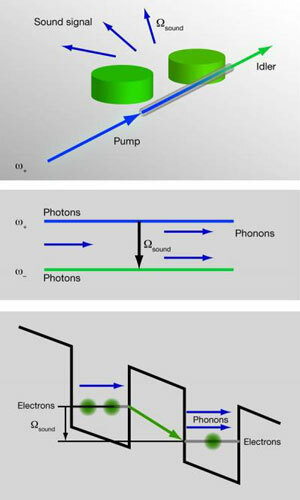 Just as optical lasers have been incorporated into countless, ubiquitous devices, a phonon laser is likely to be critical to a host of as yet unimaginable applications. Within the framework of the conference series 'US-German Conference on the Commercialization of Nanotechnologies', Germany Trade and Invest is presenting business opportunities for American companies and research institutes in the field of nanotechnology in Eastern Germany. The European Commission has launched a joint FP7 Future Emerging Technology research project TRAMS aiming to investigate the impact of increasing variability and decreasing reliability of the components in future terascale memory systems and to create new design paradigms which can secure their reliable operation in future multicore processors and system on a chip applications. As computer chips rapidly continue to evolve, new technologies must be developed to closely monitor the fabrication process and guard against faults at a sub-microscopic level. Co-Action Publishing has announced the launch of their latest title, Nano Reviews. The journal's Editor-in-Chief, Professor Vasudevanpillai Biju of the National Institute of Advanced Industrial Science and Technology (AIST), Japan, seeks no less than to organize the flood of studies that are currently emanating from the Nanoscience, Nanotechnology, Nanobiotechnology and Single-moledule research areas - the 3NS field. Materialwissenschaftler der Uni Jena entdecken 'universelles selbstorganisierendes Molekuel'. The Center for NanoScience (CeNS) of LMU Munich announces the call for applications for PhD scholarships in the framework of the International Doctorate Program 'NanoBioTechnology'. The Australian Government is introducing a comprehensive national framework to guide the safe development of new technologies such as nanotechnology and biotechnology as part of a $38.2 million National Enabling Technologies Strategy released today. Recent breakthroughs by their team at JILA, a joint institute of CU-Boulder and the National Institute of Standards and Technology, have paved the way on how to build a tabletop X-ray laser that could be used for super high-resolution imaging, while also giving scientists a new way to peer into a single cell and gain a better understanding of the nanoworld. AAAS panel mulls science and public acceptance. Nanotechnology could aid the future of development of the Arab region, says Mohamed H.A. Hassan, executive director of TWAS, the academy of sciences for the developing world, and president of the African Academy of Sciences. By dipping ordinary paper or fabric in a special ink infused with nanoparticles, Stanford engineer Yi Cui has found a way to cheaply and efficiently manufacture lightweight paper batteries and supercapacitors, as well as stretchable, conductive textiles known as 'eTextiles' - capable of storing energy while retaining the mechanical properties of ordinary paper or fabric. Solid-state lighting and its potential as a near-term generator of energy efficiencies will be the topic of a presentation by Julia Phillips, director of the Physical, Chemical, and Nano Sciences Center at Sandia National Laboratories, at the 2010 AAAS annual meeting. The Methodist Hospital Research Institute was awarded an $11.5 million Center Grant by the National Institutes for Health (NIH) today to study the best way to attack deadly cancer stem cells to enhance treatments for breast cancer. Michigan State University physics assistant professor Chih-Wei Lai has received a National Science Foundation Faculty Early Career Development Award for work which may allow for the development of new quantum materials and optoelectronic devices for improved computation and communication. Montana State University scientists are researching the use of nanomaterials to develop a new way of fighting influenza and other respiratory infections caused by viruses.